The base map gives you some details all over North and South America, do scroll to Chili or Argentina and you will see some details (zoom in enough). But if you look in Europe, Africa, Asia or Australia, you will see nothing. With the Garmin product World Wide Maps you can have more details in these other regions, but still not routable and the information is not much either. Solution is known longer for other type of Garmin GPS units. I have tried the solution on my Z?mo GPS and it works perfectly. If you don't have a Garmin map product on your PC then skip step 1. Mapsource should be installed on your PC in step 1! - Copy the file GMAPBMAP.IMG from this Zip file to a folder on your PC. - Make a backup of the file gmapbmap.img which is in the GARMIN:\Garmin folder at your Z?mo. - Disconnect your Z?mo from your PC and let it start up. - Check if you see roads at Miami, Capetown, Sydney, Amsterdam (zoom out, move and zoom in). 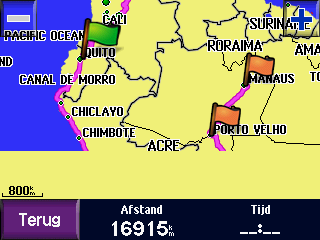 - Make a route in your PC with Mapsource at the World routable Base map and download it to your PC. If it all went ok, you have completed your upgrade. 2 - Detailed map USA version 8NT, routable. Rename this gmapbmap-Orig.img so you have a backup copy. BaseMap which is 31 mb in size and has much more detail. than using the original basemap (left). Rewritten, based on information in an original post by Scheurneus. Ok, the question is: I have a routable map in Mapsource and can i download it to any GPS? No, it is not possible. This map is the other way around. 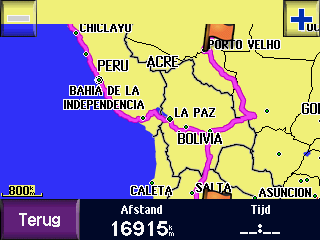 The map in Mapsource is a GPS device basemap which is used to make a Mapsource map. So it is not a standard Mapsource map which can be selected and downloaded to a GPS. But, forget Mapsource, you have a basemap! And it needs no processing to be used. It can be used in the Zumo by copy the map to the internal memory. This means that theoretical this basemap can be used in any Garmin GPS! And i think that practical this can be done in any Garmin GPS which has some kind of memory which is reachable by explorer. But if you look in other forums about custom maps loading to Streetpilot GPSses, there is a tool something like IMG2GPS which can be used to upload manually additional maps to the GPS. For now i only know for sure that the Zumo and Nuvi series will work. Probably the 60csx, 276, 278 and 28xx series as well. For the rest, i don't know.